Moderne 36 m2 lejlighed med balkon, panoramaudsigt over Paris og Eiffeltårnet, som ligger i det livlige kvarter Montparnasse i nærheden af ​​Saint-Germain des Prés. Det har et fladskærms-tv med internationale kanaler, ubegrænset højhastigheds trådløs internetadgang og husholdningsudstyr opskalere. Muligt for tre voksne eller to børn. Vue imprenable, bel appartement, bien équipé....à refaire !! This little apartment has everything you need for the perfect Parisian holiday. This was my first trip to Paris as a solo female traveler, and I felt VERY safe and secure at this apartment. Like the rest of the reviews, the Eiffel Tower and Les Invalides are much bigger in person, breath taking, really. Watching the Tower sparkle at night while sipping on Rose wine will become a cherished memory. The bed is extremely comfortable, the rain shower, divine. You may have noticed some reviewers mentioning that the apartment can get hot. I can help you with that. There is an electric shutter (outside blind) that you can pull down while you are out exploring the city. This keeps out the heat, which is largely due to the sun bouncing off the white wall of the building beside the end unit. There are also two fans in the apartment, one is like a Vornado fan and for its size, puts out a lot of air . Once the sun goes down, open the sliding door and the shade and the cool air fills the apartment, just in time for wine and cheese and gazing over the city. The kitchenette has almost everything you need. There is no oven,but there is a microwave/converter oven and a cooktop. The area is loaded with restaurants, boulengerie and patisseries. The train station is right across the street as is a grocery store. It’s a leisurely 15 minute walk to the Luxembourg Gardens. I loved this apartment and would not hesitate to book it again! My wife and I stayed here for one week (June 2018). Owner response was great, apartment was beautiful, amazing view, great balcony, and large bathroom and great shower (unusual for Europe). Bed was comfortable. Building is conveniently located to many Metro lines and right in the heart of the city. We chose this property because of its view and good location. Both turned out to be excellent. The expansive view of the Eiffel Tower and Les Invalides were lovely by day and spectacular at night. The neighborhood was filled with cafes, restaurants, patisseries and a grocery store. Across the street is Gare Montparnasse, a major train station with metro and bus access to the entire city and train service to places beyond Paris as well as quick direct transportation to and from both major airports. The space was small but very cleverly used, with the entire kitchen hidden behind cabinet doors, and tasteful sliders separating bed from sitting area. The shower was large and modern, as were all the appliances and fixtures. Overall we were delighted with our stay here. Morning coffee on the deck with its majestic view of iconic Paris added immense joy to our time in that city. There were some small, easily fixable issues. The bed had a terrible smell, which we traced to a mattress cover with a plastic coating. We removed it and set it out on the balcony. After that the bed was fine and very comfortable. A more troublesome matter was that the phone didn’t work. At least I couldn’t make it work. We didn’t have mobile phones that work in France. Fortunately, the wi-fi was fine, so we made plans with friends in Paris via email instead of phone, which was somewhat awkward and time-consuming. We could find no toilet paper beyond the one on the roller, and the soap dispenser in the bathroom was all but empty. All these matters are easily fixable and wouldn’t in any way prevent us from happily returning. The one caution that’s not so easily fixable is that the apartment has no cross ventilation. We arrived in early June on a day when the outside temperature was 27-deg C (about 80 deg F). The apartment was hot. Even opening the balcony slider didn’t help, and neither did opening the hall door, because the hall was worse. Fortunately, the weather cooled down overnight and the next few days were fine outside and inside. While I’d eagerly rent again in moderate months, I’d be concerned about July and August. At the very least an electric fan might be helpful. That said, judging only from our personal experience in this apartment I have no hesitation in giving it five stars. Great location, arrangements went smoothly, very clean. 4th stay. Needs some new furniture. Great apartment in the perfect neighborhood. Owners have very easy to work with. We had an amazing time at this place. 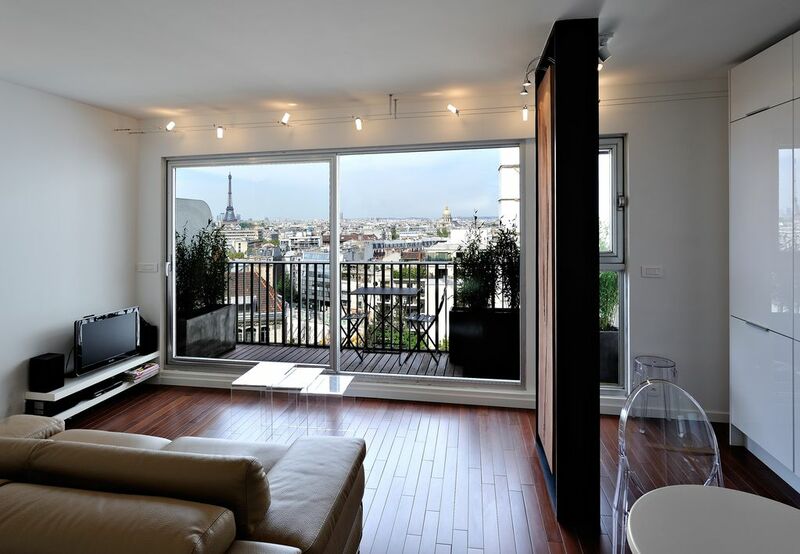 We wanted a convenient location for my wife and myself during our time in Paris, and especially with a view. I must say that every other review stated how amazing the view is but you just can't comprehend the beauty until you visit this place. Looking out through the window during the day for the first time upon arrival was incredible, but the real magic came with our first sight of the tower at night - absolutely breath-taking. The rest of the place was fantastic as well - comfortable bed, nice bathroom/shower. Small toilet area but not a huge deal. Plenty of nice kitchenware and a small kitchen area to prepare stuff (we loved coming home with wine/bread/cheese and eating it inside/outside on the deck. We came in May so the outside temperature wasn't too bad but the room would get somewhat warm in the evenings, even with the windows open (just be aware) - but not a dealbreaker. And again, the view is absolutely incredible and worth every penny. If you are looking for a great location, reasonable price, and jaw-dropping view of the Eiffel Tower, look no further and reserve this place. Thank you so much for a fantastic trip! Also FYI, receiving our security deposit back very quickly after the trip. Seamless. District of Saint Germain des Pres rue de Rennes, Rue de la Gaite, togstation, Montparnasse tårn og indkøbscenter. Metro-station 'Montparnasse Bienvenue "til 3 minutter. Nær taxi station, offentlig transport, Air France bus fra Orly og Roissy lufthavne. A partir de la 3 ème Personne, il est facturé un de supplément de 5 € par jour et par personne. From the third person, he is charged an additional 5 € per day per person. Veuillez laver et ranger votre vaisselle. Les poubelles doivent êtres vidées au -1. Please wash and put away your dishes. The trash must be emptied at the -1 floor.